Chinese celebrities have been warned against appearing in public with supporters of the Dalai Lama, as it may lead to the impression that they support the ‘separatist’ movement. The warning comes from the Chinese state media, following the participation of two Chinese celebrities in a Buddhist function in India, with officials of the Tibetan government-in-exile. 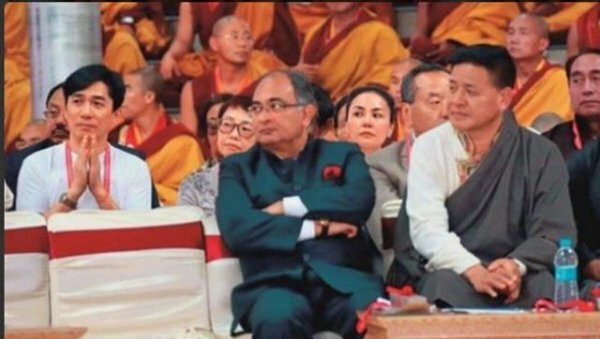 The Chinese state media has threatened two Hong Kong superstars with a “spontaneous” public boycott after they were spotted at a Buddhist function in India with officials of the Dalai Lama-led Tibetan government-in-exile. The official China Tibet Online published a scathing piece last week, saying celebrities will have to “swallow bitter pills themselves” if they do not exercise restraint in their behaviour. The two were identified as acting superstar Tony Leung (the star of movies such as “The Grandmaster” and “In The Mood For Love”) and singer-actor Faye Wong. Another star, Hu Jun, too was present. Wong, Leung and Hu were seen in photos of a February 14 event in Bodh Gaya marking the 92nd anniversary of the birth of the late predecessor of the 17th Gyalwang Karmapa, Tibetan Buddhism’s third-highest spiritual leader, Radio Free Asia reported. The Chinese government calls the India-based Dalai Lama a “separatist” inciting violence in the Tibet Autonomous Region (TAR). “…photos show that two core leaders of Dalai Group sat in the front of these artists; the two are served in the so-called ‘Tibet government-in-exile’. The ‘king’ and ‘queen’ of the entertainment circle sat with Dalai core group leaders together, which can be easy for the public to misunderstand,” the article said. The article said it was alright for them to worship the Buddha but religious freedom has its limit. “Indeed, it’s ok for Faye Wong and other artists to worship the Buddha, to participate in religious activities. Faye Wong, in early 2006, toured India to pray. In June 2012, she again went to India and continued praying too, accompanied by Tony Leung’s wife Carina Lau. She can speak for the ‘India pilgrimage’. Tony Leung and his wife Carina Lau, also in 2008, went to India to pray,” it added. According to Radio Free Asia, Chinese authorities cancelled a planned tour by US bands Bon Jovi and Maroon 5 last year because they were associated with the Dalai Lama.